Lauren Johnson, a criminal justice outreach coordinator with the ACLU of Texas, advocated for a fair chance hiring ordinance in Austin. Two decades later, job applications had moved online. Something else had changed, too: After spending three years in and out of prison for various drug charges, Johnson had a felony record. She now had to start checking the "yes" box on applications that asked whether she had a criminal record. Electronic applications often wouldn’t let her leave this blank. Suddenly, Johnson missed paper applications. Johnson's concerns were alleviated when the Austin City Council passed a fair chance hiring ordinance in 2016, becoming the first in Texas and the South to do so. (The law’s also known as "ban the box," referring to the boxes job applicants are asked to check regarding felony history.) The ordinance prohibits private employers with 15 or more employees from asking candidates about their criminal records until they’ve reached the final phase of hiring and been extended a conditional job offer. Violators face written warnings and fines. But the two-year-old policy is not being enforced. According to records obtained by KUT and interviews with staff, the city has received five complaints since the rule went into effect on April 4, 2016. All the investigations are currently "pending," despite the fact that four of them were filed in 2016. The most recent complaint was filed in September. In one complaint, a person alleged that a workers’ comp insurance company did a criminal background check before a conditional job offer. Another complainant alleges that a local moving company asked about criminal history in an online job application. Staff with the city’s Human Resources Department said they prioritized education over enforcement and have not had time to write rules dictating how to investigate complaints. Right now, if the city wanted to fine an employer violating the rules, it wouldn’t have the process to do it. After being notified by staff, City Manager Spencer Cronk said he had directed them "to bring any outstanding complaints to a resolution and complete the administrative rules process as quickly as possible." City Council passed the fair chance hiring ordinance by a near unanimous vote just past 10 p.m. on March 24, 2016. News reports described how advocates who had testified erupted into cheers, hugs and tears. The law went into effect 11 days later, although it gave city staff time to get enforcement up and running. The city could issue written warnings over the next year, but it wouldn't begin issuing fines of up to $500 until April 2017. But the city hasn’t done any of this. 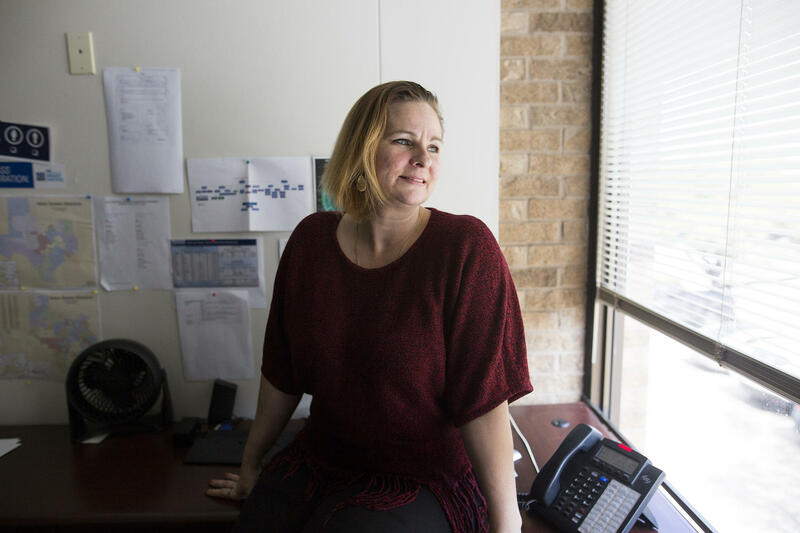 "When you ask the question, ‘Why are we not enforcing?’ I don’t think that's the fair question,” said Joya Hayes, director of Austin’s Human Resources Department, which is charged with implementing and enforcing the ordinance. “I think it's, ‘Why haven't we gotten to enforcement?’"
The city has neither of these in place. Several months after passing the "ban the box" rules, Council members approved the city’s 2016-2017 budget, which included nearly $300,000 to hire three full-time employees to oversee fair chance hiring. These employees, whose jobs range from answering complaint calls to investigating cases, were hired between October 2016 and April 2017. In March 2017, the city contracted with a marketing consultant to do public outreach for $55,000. But more than six months after the ordinance went into effect, city staff had not yet started actively educating the public. It had set up a phone number and email address for complaints, and posted an FAQ on the city website. Hayes said that in December 2016, the City Manager’s Office told staff to hold off on working on the ordinance while state lawmakers considered bills to overturn it. “We did not want to spend and expend funds and go out and educate the community on an ordinance that may have been preempted by the government,” Hayes said. Staff was directed to hold off until August 2017, the end of the special legislative session. No bill was passed, and Austin’s ordinance remained in place. As the city began its outreach, it failed to prioritize writing rules for how it would investigate complaints. Hayes said the city expects to make final investigative rules public next month. When Austin passed its "ban the box" ordinance, it joined at least 100 other municipalities with similar laws, including Washington D.C., Seattle and Philadelphia. These laws share the same intention: ensuring that people with criminal histories are evaluated fairly when applying for jobs. But the specifics differ. For example, San Francisco caps civil penalties at $50 for an employer's second violation. How these laws have been enforced also differs. Here, Austin appears to be the outlier. 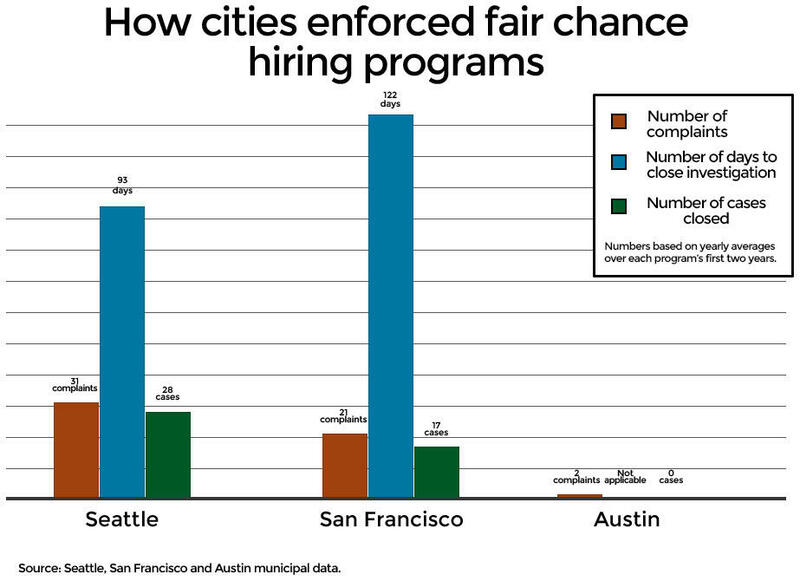 According to data found online or provided by various city agencies, cities with fair chance hiring rules field more complaints on average per year than in Austin (in some cases, at least 10 times the amount) and have been taking action against violators since their rules became effective. "To have a city as big as Austin and only have received five complaints thus far, really connects us to our ability to engage companies very closely in the education outreach." In the first nine months of Washington, D.C.’s ordinance, the city received more than 400 complaints and settled 71 cases via mediation, according to an audit by the Office of the District of Columbia Auditor. Two years after its law passed in 2013, Seattle had received an average of 31 complaints per year and closed 28 per year. Investigators spent an average of 93 days, or roughly three months, closing each case. Austin city staff say as of two weeks ago, they’ve reached out to all complainants and employers accused of violating the ordinance, but have closed zero cases and taken no action against the companies. As for the city’s small number of complaints, Hayes said it speaks to the city’s education efforts – a point that’s impossible to prove. “To have a city as big as Austin and only have received five complaints thus far, really connects us to our ability to engage companies very closely in the education outreach,” Hayes said. What Does This Mean For Paid Sick Leave? 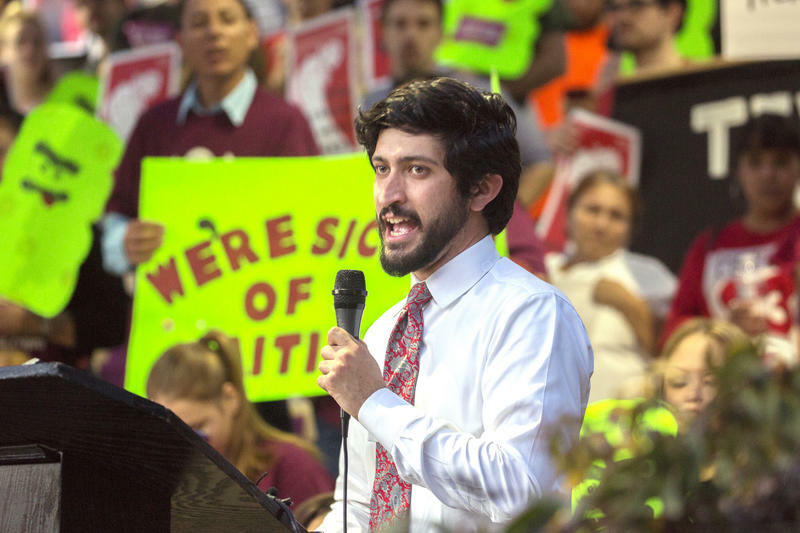 Last month, fair labor advocates celebrated another policy win at City Hall: an ordinance requiring up to eight days of paid sick leave for all private employees in Austin. It unfolded not unlike the campaign for fair chance hiring: Organizations rallied and campaigned at least half a year before the vote. Advocates testified passionately for hours. When the ordinance passed late in the night, the crowd celebrated. "When we say that we're so progressive but then see our failings, it creates the energy and, I think, the political will to get a lot of things done." The paid sick leave ordinance goes into effect for most private employers Oct. 1. Hayes said city staff will have investigative rules in place on that day and be ready to take action against companies that violate the law. Casar said he’s disappointed that the policy he worked to pass has not been enforced, but he believes knowing this will reinvigorate activists to hold the city accountable. He said while Austin, at times, does not live up to the progressive brand it prides itself on, its citizens hold the leadership accountable to that self image. Johnson said she thinks the city will too often pass a progressive policy, then move on to the next issue without considering the work that needs to be done to make these policies effective. Rachel Cooper contributed to this report.